Bey is drawing serious interest from Ivy League schools, among others, because he doesn’t just excel on the football field but in the classroom, too. 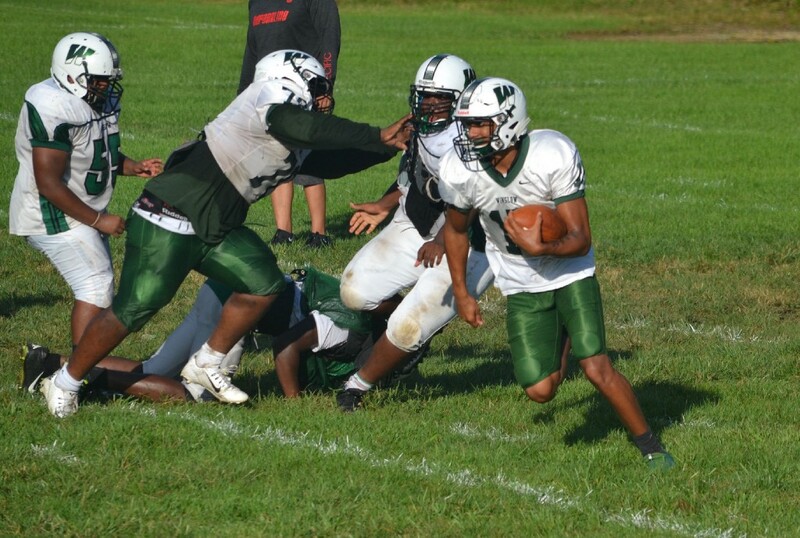 If you do any research on Winslow Township High School quarterback Prince-Dru Bey, you’ll almost certainly see a two-word description attached to his name. Bey has a strong, accurate arm and he can use his legs to churn out big plays, too. You could also use “dual threat” to describe Bey’s ability to change a game on either side of the ball. 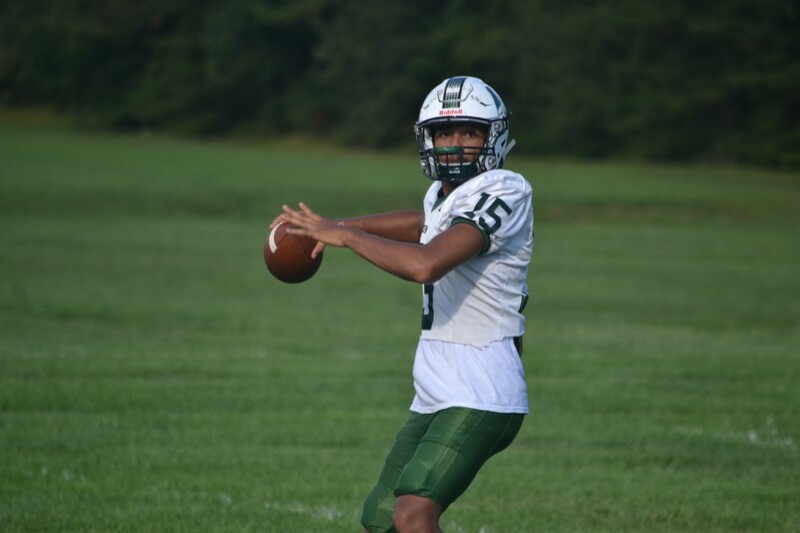 In addition to his offensive exploits (four touchdowns, 399 yards passing, 52 yards rushing in two games) he also had an interception in each of Winslow’s first two games, against Woodrow Wilson and Moorestown. But you might want to consider using the “dual threat” description for Bey when it comes to his athletic and academic prowess. 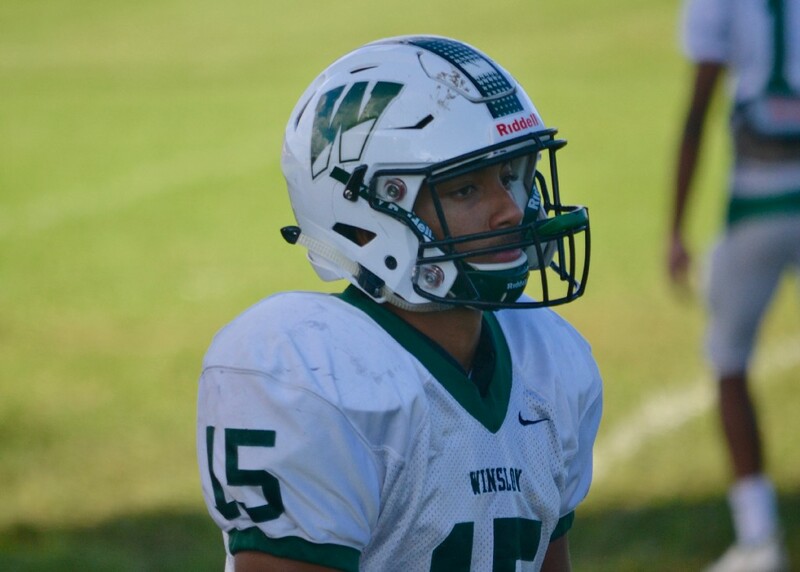 The senior and youngest of three boys who have come through Winslow’s program in the last 10 years is being recruited by Ivy League schools because of his penchant for getting almost nothing but A’s. According to rivals.com, Bey has received offers from Dartmouth, Brown, Cornell, Georgetown, Bucknell, Colgate, and Holy Cross. Bey has the perfect personality to be a leader on the field, whether it’s as a quarterback or a defensive back. And now The Sun One-on-One with Prince-Dru Bey. The Sun: When was the first time you ever threw a football? 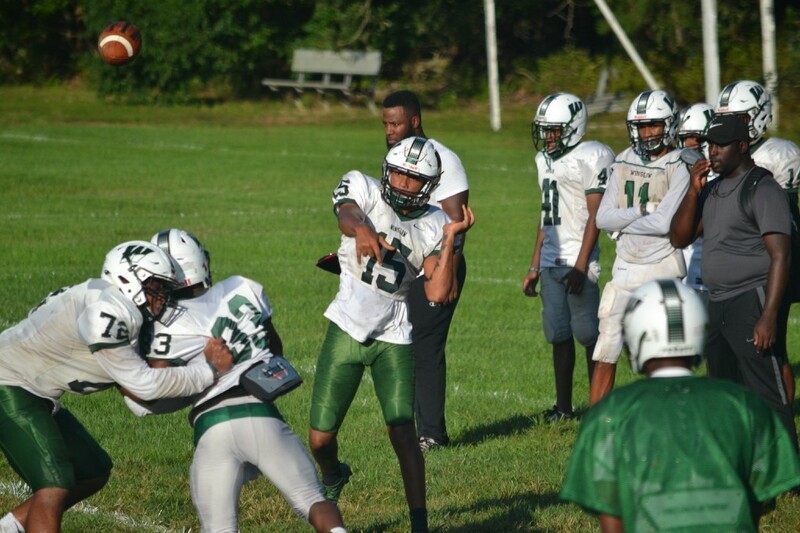 Bey: (In) 105s (youth football). I was 14 or 13. I played for the 70s, the 85s for two years, then the first time I played with the 105s, those first four years I played tight end and receiver, that’s where I got my receiver skills. But the second year our quarterback moved up because his dad wanted him to and there wasn’t anyone to play quarterback and they just tried me out. Been doing it ever since. The Sun: Has football always been your favorite? The Sun: What else did you play as a kid? Bey: I played basketball, I still play basketball. Football and basketball have always been my main sports. The Sun: No baseball or wrestling? Bey: Nah, I’m a gym guy. Any other sport in gym I’ll play, but it’s just football and basketball. The Sun: Do you have any brothers or sisters? The Sun: Was one of them out here? Thought I saw another Bey. Bey: That’s my cousin, Kalieb. Yeah, I have two brothers, both went here. One of them is Kelvin (Wagner), the other is named King (King-David Bey). I’m Prince and he’s King. King was actually my center for two years here. The Sun: Either of them play in college? Bey: Nah, my older brother played college football, D-II at Shaw University. My other brother played at a trade school but he didn’t like it there. The Sun: Who do you credit to getting where you’re at now? Bey: My brothers. Me and my brothers were very close before they went to college — well, we’re still close. So shout out to them. (Kelvin) is 26 years old, King is 18 or 19. Bey: [Laughs.] Yeah that’s just my mindset. I know what I’m capable of. I can run the ball, everyone knows I can throw the ball. So I just want to put a goal in my head, it’s always good to have short-term goals, long-term goals. That’s what I just like to do: put a goal in my head and try to achieve it with my teammates. The Sun: What do you think is the best thing you do as a quarterback? Bey: I would say everything, for real. I can run the ball, I can throw the ball. But I think my best is knowing my guys. I put trust in my receivers, I make them better, and they make me better. I think that’s my best (trait). The Sun: I was going to say your deep ball. The Sun: I was watching some video. Bey:[Laughs.] Yeah, it’s accurate but I credit my guys for that, my receivers. The Sun: Do you prefer offense or defense? Bey: No, I’m serious! I’m just a football guy. However I can help the team out. I’ll play defense, I’ll play offense. Anything but the line. Bey: But I’ll get out there if you need me. You’re looking to play in college, right? Getting offers? The Sun: You’re a pretty good student I understand. Where do you want to go? Bey: Right now I’m looking at the Ivy Leagues. We need my SATs to get higher a little bit and then I’ll be fine. The Sun: That’s awesome. When people talk about you being a dual threat I think they might have it wrong, you’re a dual threat in the field and in the classroom. The Sun: I guess you take a lot of pride in that? The Sun: What’s your favorite school subject? The Sun: Are you just naturally good at math? Bey: I do get all A’s but I just anticipate math more than I do other classes. The Sun: Do you have a favorite teacher? Bey: Ms. (Chantel) Smith, Mr. (Ethan) Bobo. Miss Smith, my math teacher, I had her last year and this year. Mr. Bobo, he helped me through a lot, even outside of classes. That’s what I like about them. You’ve got Coach (Curtis) Custiss. So shout out to them. The Sun: What do you want to do if you’re not playing football in 10 years? Bey: Nah, I should start searching. The Sun: Do you have a favorite athlete? Bey: I’ll go Aaron Rodgers. You saw that game he had. The Sun: There’s nothing wrong with that choice. Bey:[Laughs.] You saw the game he had. The Sun: That’s a good one. Bey: Favorite food, I’ll go wings. The Sun: Any particular place? Bey: Um, shoutout to PDQ, I actually work there. The Sun: Oh yeah, I’ve been there. That is good. Bey: Shout out to them, they are my guys. The Sun: If you can meet any one person in history, dead or alive, who would it be? Bey: That’s a hard one. [Long pause.] If I can meet any person [another pause] I’ll say Martin Luther King. The Sun: Who would you want to play you in a movie? Bey:Who would I want? Denzel. No. I don’t think he could play football, he can coach. The Sun: I got one for you: Michael B. Jordan. The Sun: … he was in Friday Night Lights and played a quarterback. Bey: As a matter of fact, yeah, Michael B. Jordan. The Sun: I’m giving you the answers here. The Sun: Do you have a favorite movie or TV show? Bey: Um… Wild ’N Out. The Sun: Where’s that, on Netflix? Bey: Nah, I think it’s on MTV I think. The Sun: I’m too old for MTV, I used to watch it when I was your age. Bey: But Sportscenter is my go-to, when I wake up. The Sun: Last one. If you had a Friday night off and you could go watch any player in South Jersey, who would you go watch? Bey: Ahhhhhhh… I want to name a couple. Bey: We have a little group here in South Jersey, we call is S-1–9. It’s a group of 19. 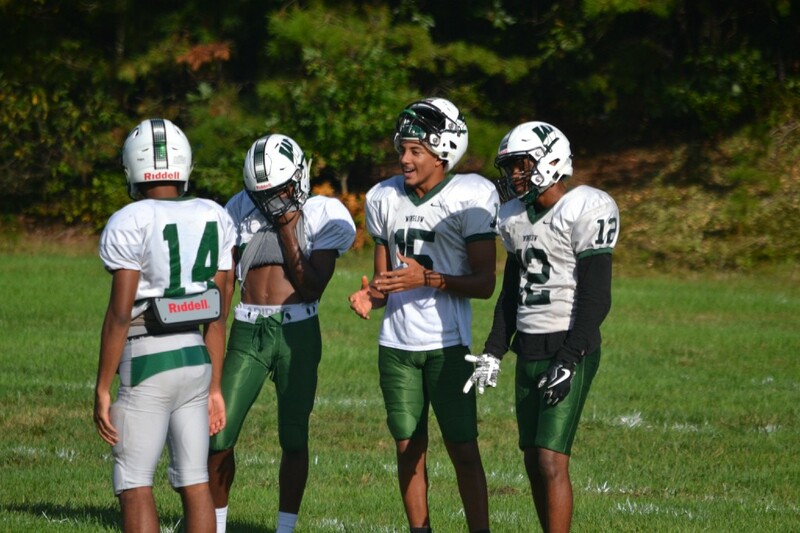 Like Nahzir Russell from Pennsauken, our Camden guys, Ron Custis, Monte (Williams), Jajuan (Hudson). There’s a lot of people. The (Timber) Creek guys. At Woodrow (Wilson) you’ve got Stanley (King) and them. You’ve got Williamstown, J.C., (Jonathan) Collins. Bey: They’re my guys, I have to represent.